What is SearchLog? At its simplest, it is a searchable weblog with a lot of features. But if you’re only looking at SearchLog “at its simplest”, you’re missing a lot. Something that can be as public as a weblog or as private as a diary. 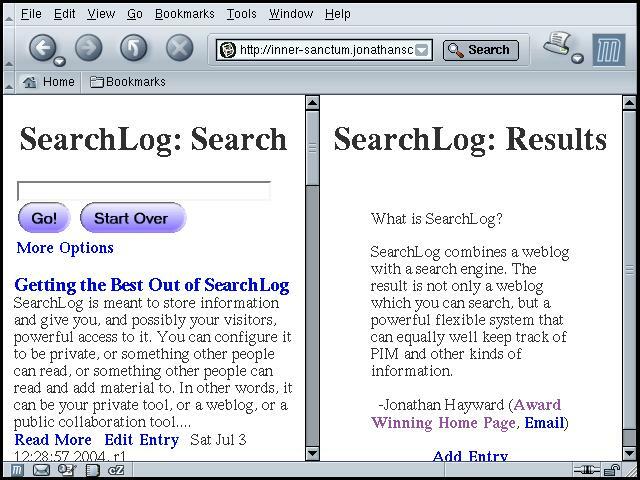 A functional search engine over everything in the log. A search engine that will highlight what you’re looking for. A place to keep track of ideas. A tool to search through ideas and see what’s related to what. A flexible tool that lets you edit information while keeping an archive. A tool to help keep an office in touch. A portal that provides an excellent starting point for the Web. As well as these “blades”, it is designed to be “expert-friendly.” It uses usability principles to try to give the serious user maximum power for minimum effort and keep mousework to a minimum.